On Nov. 6, Southwesters elected three new Advisory Neighborhood Commissioners, and a new Ward 6 Representative on the State Board of Education. “The Southwester” reached out to these newly elected representatives and asked them to submit a brief statement about themselves, their priorities and their goals in their new positions. 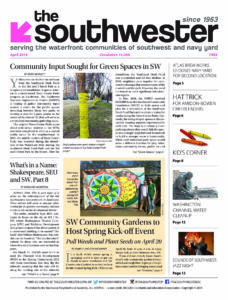 “Southwester” staff made only minor formatting edits to these statements. As a resident of Southwest DC for over a decade, I have had a front row seat to some of the amazing changes that are taking place in our community. With this change comes new opportunities for economic development as well as some growing pains and potential pitfalls. I am excited to be the next Advisory Neighborhood Commission (ANC) for SMD 6D05. As ANC I will be a voice for strong neighborhood schools for our children, adequate housing for young families and safe streets for one of the fastest-growing parts of DC. The ANC can play a critical part in securing investments for our schools and making sure our children have everything they need to learn and grow. Schools like Amidon Bowen Elementary School and Jefferson Middle School need capital investments, teacher development resources and program funds in order to be successful. As ANC I will not offer my Yea vote for any development project that does not support our local schools in some way. As the father to a 4-year old boy, Jaden, I know that the future of our children is too important not to make this a top priority. Over the next several years we have several new projects slated to be constructed in SW DC. While cranes are good for the economy, they do not build and sustain communities. For many years, residents have tilled the field and made this community attractive for new comers. However, they’ve seen the surge of rent and housing costs leave them in the dust. As ANC I will fight for projects that offer a significant number of units at 30% and 40% Area Medium Income (AMI). Equally important is the need for affordable, family-size units. Lastly, this community is seeing a wave of new visitors flocking to our streets and partaking in the new attractions. These increases are accompanied by a rise in both violent and non-violent crime. In the last few months, thefts and violent crimes in our neighborhood are up. While I believe that our women and men in uniform are doing everything they can to help fight this trend, it’s important that we have an ANC that supports their work and will fight for more resources. As a Marine, I know what it takes to coordinate with various stakeholders on short and long term threats, and as Commissioner I will continue this work and partner with MPD and stakeholders to tackle this important issue. As ANC for 6D05 I will always remember public service is a privilege entrusted to me by my neighbors. I look forward to serving this great community. I can be contacted at: 6D05@anc.dc.gov or (718) 213-6770. My name is Edward Daniels and I am proud to call Washington, DC, home for 16 years. I graduated from UVA in 2002 and moved to DC to begin an acting career in stage & film. My stage work includes shows at the Kennedy Center, Studio Theatre, and the Helen Hayes Award-winning production of RENT at the Keegan Theatre. My notable television work includes House of Cards, VEEP, and most recently appearing in Showtime’s Homeland. I am the proud owner of two small businesses, Scorpio Entertainment, celebrating 14 years next fall, and Monologue Madness, a theatre competition (produced at the Miracle Theatre on Capitol Hill) funded in part by the DC Commission on the Arts & Humanities and expanding to Atlanta, GA, in 2019! The Capitol Riverfront project captivated me during the early development of the BID and I have closely followed the growth of the neighborhood, moving here in 2016. I have a long history of student government in secondary school and undergrad and was certain that I would get involved in politics at some point later in life. I decided to get involved this year, in particular, for two reasons: Our national political climate is horrible, divided, and our democracy is at stake, daily. Locally, upon learning that our ANC seat would be vacant, I found this to be the perfect opportunity to take a seat at the table, as it were, and become more involved in the decisions that are being made which affect our neighborhood. Campaigning and meeting hundreds of my neighbors over the past three months was quite rewarding and I am still at a loss for words in describing the energy and excitement of election day. I am grateful to have been elected to serve this two-year term. My platform seems to have been very much in-line with the immediate concerns of the residents whom I will now represent. I am a huge fan of efficiency and I completely loathe bureaucracy. In my opinion, it shouldn’t take years for a traffic light or correct signage to be placed at a dangerous cross-walk. It shouldn’t puzzle developers that, at some point, along with construction and planning, resident concerns regarding affordable housing, inadequate parking, and poor property management, need to be addressed. I don’t expect to completely solve many of these concerns, but I plan to work as hard as I possibly can to alleviate them and to be an amazing resource to each of my neighbors. 6D02 is exceptional for our wonderfully diverse population, mix of single-family homes and high-rise apartment buildings, government offices and businesses, and recreation and performance facilities, all so close to spectacular waterways. In the seven years I’ve lived in the area, it has been a pleasure to meet long-time residents and new transplants who share an appreciation of the tight-knit and welcoming community here in 6D02. As the neighborhood continues to change and grow, we need to pursue creative, sustainable, mixed-use and mixed-income development that incorporates retail, affordable housing, and green space, while promoting best practices for changing traffic and parking patterns. Economic growth and development should be accessible to all groups, regardless of income or demographic identification, and the ANC has to promote these opportunities for everyone’s benefit. Specifically, in SW, I want to see the Randall School project move forward. This is an incredible opportunity for our neighborhood: a world-class art museum open to everyone, with all the jobs and educational opportunities it will bring, along with the restoration of a now-abandoned, historical building. As a former Peace Corps volunteer in El Salvador, where I taught music classes to kids, I believe in the power of music and arts education to nurture strong, confident students. Access to affordable childcare and pre-K education that incorporates music and arts is crucial for our growing community. As your ANC Commissioner, I will listen to your concerns, proactively seek out and disseminate information, and advocate on your behalf. I’m looking forward to working on behalf of 6D02 residents. My name is Jessica Sutter and I’m the newly elected Ward 6 Member of the DC State Board of Education (SBOE). During my campaign, I assured voters that I would represent all students in Ward 6 schools, wherever they live, and all students who live in Ward 6, wherever they attend school. I promised to focus on three things: putting students first in policy decisions, ensuring the District creates and implements policies that provide equitable educational resources and opportunities for all children to succeed, and supporting the excellence of current Ward 6 schools and the creation of new school choices that meet the needs of all DC children. I intend to keep those promises. There are three things I want to accomplish as I join the SBOE. First, to find ways to better listen to and amplify the voices of all parents connected to Ward 6. I will make sure that all parents, whether residents or school parents, are able to voice concerns to DC officials. I plan to host periodic forums to listen to parents, and to connect with established parent groups, civic organizations, and ANCs. My goal is to ensure the concerns of Ward 6 parents are heard in concert with voices from all eight wards. The SBOE has a unique opportunity to elevate diverse parent voices to the state level. Second, I want to ensure that all of our schools are offering a rich curriculum, including science and social studies, for students at all grade levels. I will work with my colleagues to push for an update to the DC Social Studies standards. I will also seek to publicly share information on the time our LEAs are dedicating each week to the key content areas and what supports they may need to increase content-rich instruction beyond mathematics and English Language Arts (ELA). Finally, I will advocate for a strong focus on middle schools. Ward 6 is home to 13 schools with middle school programs, two of which are located in Southwest. Serving the academic and socio-emotional needs of tweens and teens is complex. I will ask the SBOE to call for cross-sector practice sharing by middle schools with high academic growth scores, with excellence in academic achievement and growth of specific student subgroups, and with innovative practices in socio-emotional learning and restorative justice practices. Providing a forum for DCPS and charter schools to share best practices can lay groundwork for ongoing collaboration between schools to make the District collectively better at serving middle school students. The next four years are an opportunity for steady progress towards better schools for all District students and I’m looking forward to the work ahead.